As an animal-loving nation, it is hard to believe that a blunder in national printing press during the outbreak of the Second World War led to the destruction of 750,000 British household pets in less than a week. It is not hard, however, to imagine why the mass culling of pets during this time is scarcely reported or talked about, with the extent of human death and hardship prevailing over other wartime news. Also, being such an uncharacteristic act of animal destruction for the nation, is it likely a degree of guilt or embarrassment still exists? With the outbreak of WWII in 1939, the government and National Air-Raid Precautions Committee released a pamphlet instructing all British citizens to ‘kindly destroy’ their family pets if they could not be cared for by neighbours or alternate means in the state of an emergency. The pamphlet, perhaps intended to ease the panicked minds of Britons during wartime when food and provisions would be scarce, resulted in even greater panic, causing many to abandon their cats and dogs or have them immediately euthanised. Battersea Dogs and Cats Home was one establishment whose doors these domestic pets were dumped outside during the period of hysteria. Those working at the RSPCA reported that ‘their primary task [had become] the destruction of animals,’ as people went off to war, had their homes destroyed or could no longer afford the ‘luxury’ of a pet. In London alone, some 400,000 animals were taken to veterinary surgeries or animal care shelters to be exterminated in advance of war, while all the exotic animals (many of which were endangered) at London Zoo were also put to death. The pamphlet, which read: ‘If at all possible, send or take your household animals into the country [...] if you cannot place them in the care of neighbours, it really is kindest to have them destroyed’ was taken quite literally by scared Britons, even more so when the Blitz bombings began in 1940. 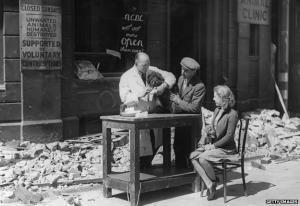 Those directly affected by the orders of the national pamphlet have spoken out about the horrors of the time, when people no longer felt they could feed or care for their beloved pets in the face of rationing and disaster. Clare Campbell, the author of a topical book, Bonzo’s War: Animals Under Fire, discusses the sad story of her uncle who, following news of the invasion of Poland, decided to immediately euthanize the family pet, Paddy. While the government eventually tried to back-track, realising too late what its careless words had begun, the seed had already been sown and the mass destruction continued. Those that did not have their animals put down but were ashamed to keep them, thinking them too much of an extravagance during wartime, had them sent abroad to help in the war effort. It is likely they died in a far worse way than had they been euthanised at home, but some argue this handful did not die in vain. The expression ‘all’s fair in love and war’ implies that with everything else going on, the death of a few animals was neither here nor there. While the destruction of domestic pets was inevitable during six long years of war, the scale of it was unimaginable and, had the pamphlet taken a different approach to the issue, far fewer family pets would surely have been killed. If you know any more about this discussion or have thoughts to share, please post them below. My cats are too precious to actually think of such an "AWFUL"